Petunia is at the perfect bubble-crazy age. She loves to chase bubbles around the yard, saying "BUH-ble, BUH-ble". Pumpkin still likes to chase bubbles, too, so time in the backyard chasing bubbles is a favorite weekend and after dinner activity here these days. The only problem is that neither of my kids has mastered blowing her own bubbles yet, and of course, they both want to try. Also, I cannot blow bubbles fast enough to keep up with their demand. Which is why I love, love, love the new long bubble wand things that are all over the place these days. You can get them on Amazon . But I got ours at our local grocery store. When I use the wand, I can make a fairly steady stream of bubbles just by waving my arm around. So I get the volume of bubbles like I'd get from a bubble machine but I never have to change batteries or unclog the mechanism. 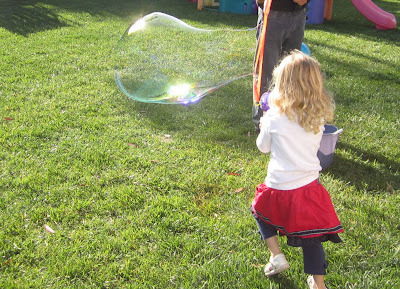 When the kids use the wand, they can actually make their own bubbles- even Petunia can. Of course, she usually spills the bubble juice all over herself, but that's OK. Bubble juice is cheap. In short, this is an awesome invention. 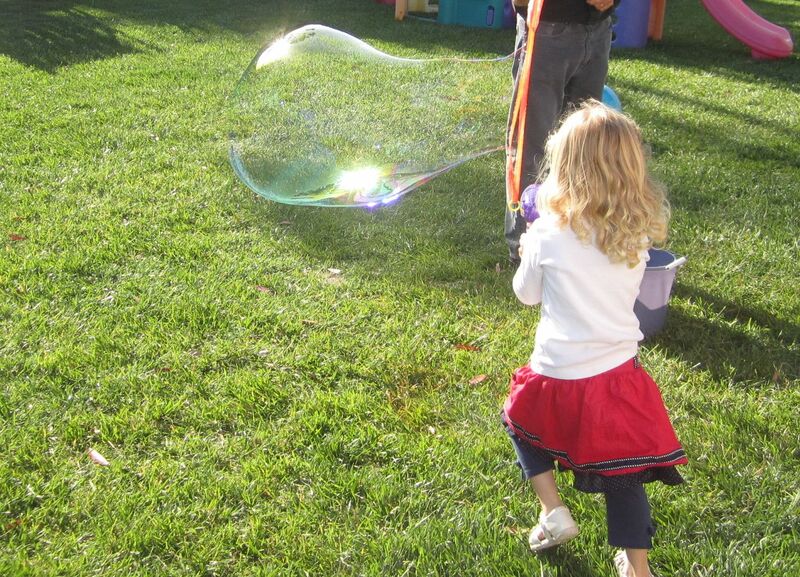 We also have the Klutz Big Bubbles kit, and the kids love that, too. OK, so do the grown ups. This post is NOT sponsored or anything like that, but the Amazon links are referral links- i.e., if you click on them and buy something from Amazon, I get a (very small) cut of the purchase. Bubbles are great. And I'm totally going to have to check out those wands! 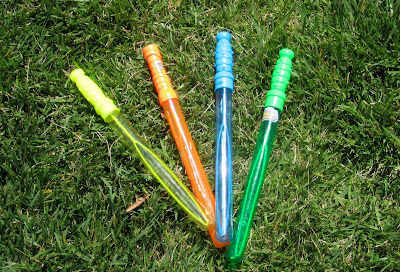 At my girl's school, they made bubbles with soap and water (obviously) but they used pipe cleaners to make wands. She brought hers home, and I let me tell you: best bubble maker we have!!! So if you have any pipe cleaners in your arts and crafts supplies, make a loop at the end and enjoy! Both of my kids are able to blow through it to make bubbles, and I find it much easier than the crappy ones that come with most bubbles. That looks *awesome*. Legume just learned how to blow bubbles herself, but I know she and her sister would still love those things. By the way, have you seen the Crayola colored bubbles? Legume got some for her birthday. They make a godawful mess (although they are washable). They also freak me out a bit--bubble solution should not come in bright orange and dark green. Just this evening we spent a half hour out on the front porch blowing bubbles. Rosie can blow her own now, and Annie tries... but mostly ends up eating the bubble solution because she puts it right on her mouth and spits on the wand. Not very effective. But she is so determined to do it herself she often won't let me do it for her! Good tip on the pipe cleaners, caramama! I had no idea there were so many other bubble lovers out there! OK, actually, that is not surprising at all. @caramama- thanks for the pipe cleaner tip. We do indeed have some in our art supplies. @The bean-mom- I have seen the colored bubbles. They scare me. Another bubble lover here, too! DS has this little bubble push-cart toy (it also happens to be in the form of a certain licensed character...) that looks like a kid's lawnmower that blows bubbles. He's totally obsessed with it. @the bean mom - the colored bubbles are too intense for me, too. I have three of those bubble stick wands in the cabinet now. The last couple were turned into swords and destroyed in an afternoon. He loves bubbles but he loves sword fighting more. I now can think of nothing I want more than colored bubbles!!!! We almost always do our bubbles outside (after the Pookie-almost-cracked-his-head-open-slipping-on-soapy-solution-on-hard-wood-floor incident and resulting goose egg on his forehead) so I won't worry about stains!